Yes, I darn well should have! The book is HUGE…but its definitely worth a read. What I loved most about this book was the footnoting – like Terry Pratchett the footnotes are separate stories in themselves and often go over a few pages. Its a great way of introducing background and context. Not too much info, good writing and a fun aside from the main plot. The most frustrating thing in the book was the plot with the wife! I found it so annoying that they kept coming so close to revealing and fixing all …but no. It is kind of fitting in the end. Funnily, I kind of expected this book to be similar in world to the recent Magician movie, but was pleasantly suprised. The setting is quite similar to Temeraire, so no wonder we enjoyed it. -David says- I loved this book too. Long drawn-out period dramas don’t usually do it for me, but I couldn’t get enough of this. The challenge to the magicians of York had me interested, and the talking stones in the cathedral had me hooked. The pacing was fine for me, I just dived in and didn’t bother coming up for air. Two magicians shall appear in England. The first shall fear me; the second shall long to behold me The year is 1806. England is beleaguered by the long war with Napoleon, and centuries have passed since practical magicians faded into the nation’s past. But scholars of this glorious history discover that one remains: the reclusive Mr Norrell whose displays of magic send a thrill through the country. Proceeding to London, he raises a beautiful woman from the dead and summons an army of ghostly ships to terrify the French. Yet the cautious, fussy Norrell is challenged by the emergence of another magician: the brilliant novice Jonathan Strange. 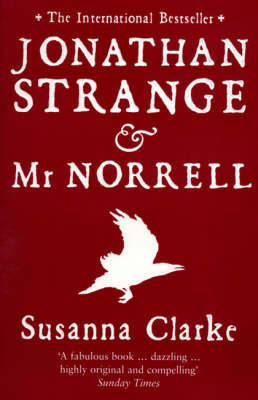 Young, handsome and daring, Strange is the very opposite of Norrell. So begins a dangerous battle between these two great men which overwhelms the one between England and France. And their own obsessions and secret dabblings with the dark arts are going to cause more trouble than they can imagine.